MOSCOW, August 6. /TASS/. /TASS/. 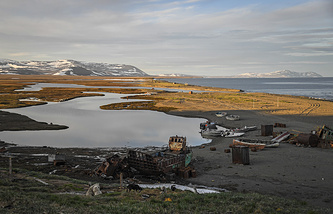 US citizen John Martin, who accidentally sailed to Russia’s Chukotka region from Alaska, has been sent to the Chukotka District Hospital for a 10-day rehabilitation course, a source in the region told TASS on Monday. "The US citizen was admitted to the Chukotka District Hospital on Friday, August 3," the source said. "His rehabilitation course will last ten days. He spent two weeks in a raft boat, eating only dried fish and drinking juice. He agreed to undergo medical examinations and a rehabilitation course as he needs to recover from his travels," the source added. Russian law enforcement agencies said earlier that John Martin William III came from Alaska’s city of Soldotna and currently lived in Anchorage. He was traveling down the Yukon River across Alaska in a one-man boat and at some point two decided to take to the open sea, however, given bad weather and his lack of navigation devices, the rafter ended up in Russia. After being found off the coast of Russia’s Chukotka region, Martin was examined by doctors who found that his health condition was satisfactory. The Chukotka authorities notified the US Consulate in Russia’s Far Eastern city of Vladivostok about the incident so the US citizen will later be taken to the city of Anadyr where a decision will be made concerning his return home. According to earlier reports, the US citizen who sailed to Russia’s Far Eastern Chukotka region in a raft boat was detained by border guards for illegally crossing the frontier. The incident occurred on August 1.